Life shouldn’t be just about receiving, it should also be about giving back. Thought the core of SAP lies in empowering enterprises to be digitally intelligent, SAP steadfastly drives to further the agenda with purpose. One of the measures of our achievement is the lives we have impacted- how many lives it has lifted out of poverty or how much of environmental concerns have been addressed or how much the ecosystem has become more enabling for economic imperatives. The leaders have realized giving back creates the momentum to move forward. “Corporate social responsibility is part of our DNA at SAP and part of our higher purpose of helping the world run better and improve people’s lives”, Alexandra van der Ploeg, Head CSR SAP, explains while talking about the company’s CSR initiatives. The three pillars of SAP CSR are (1) building digital skills, (2) Powering Best Run NGOs & Social Enterprises – accelerating social entrepreneurship and (3) Connective Employees with Purpose – employee volunteering. First two of our focus areas, we leverage the expertise of our partners, and build solid foundation through Planning Think Tank and state and central Government. Through the Code Unnati program, SAP has taken up projects like Yuva Yuga- Advanced skilling of youth in Karnataka, Atal tinkering labs with Niti Ayog, Rural skills development & STEM education, Code week in Karnataka and propagating Digital literacy with ITC, RPG and L&T Public Charitable Trust. Code Unnati will continue to foster #DigitalInclusion in India. Start-ups are redefining the business landscape of India. To give a boost to the process, it runs incubator programmes with ISB and CIIE. In order to make SAP employees more aware of their less privileged counterparts, the company encourages employee volunteering. Month of service, summer of service, mentoring in bootcamps and traditional and skilled service are all part of this stratosphere. As Dilipkumar Khandelwal, President, SAP HANA Enterprise Cloud, SAP SE & MD, SAP Labs India, aptly puts it, “Partnering with NITI Aayog is part of our ongoing effort towards promoting STEM education among the Indian youth. We plan to train teachers and other stakeholder groups and design new technology courses and projects to ensure India’s youth are ready for a digital world”. This signifies our commitment to fostering STEM Education in India. Powering Best Run Social Enterprises and NGOs not only aims to build their capacities but also to build enterprises for tomorrow, which addresses socio-economical problems “intelligently” but also create employment opportunities. SAP CSR partners with Technology Business Incubators at CIIE, IIM Ahmedabad and D-Labs at ISB to drive social enterprise accelerator initiative. SAP conducted 3 days bootcamp for social enterprises at SAP Labs in partnership with ISB. This was a part of modular cohort base Jump Start Social Enterprise, where in 10 idea stage social enterprises participated. 15 SAP experts /mentors worked on 1-1 basis with #SocEnt and enabled them with Go-to Market (GTM) strategy, product road-map validation, business strategy validation, etc. With an emphasis on this year’s theme ‘Purpose-Action-Impact’, the 14th edition of Month of Service has been the testimony of our commitment of connecting employees with purpose. Summer of Service (SOS) and Month of Service (MOS) are the two columns on which employee volunteering rests, this year. 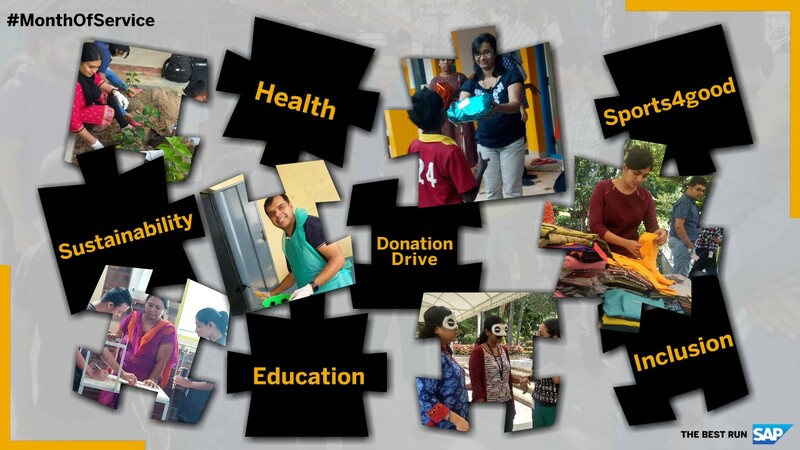 Summer of Service was held during the months of May and June in SAP India. Volunteers trained children in Dharavi in computer courses, prepared 50,000 seedballs and planted 106 saplings in a railway station. 6,645 SAP volunteers dedicated 33,020 hours and impacted 152,908 lives in the month of October as part of Month of Service. While 122 volunteers participated in on-field activities, 3 of them conducted virtual sessions for MOS. “Private sector can contribute to sustainable development goals through corporate volunteering on a global scale,” Alexandra van der Ploeg sums it up aptly.